Good Morning ! 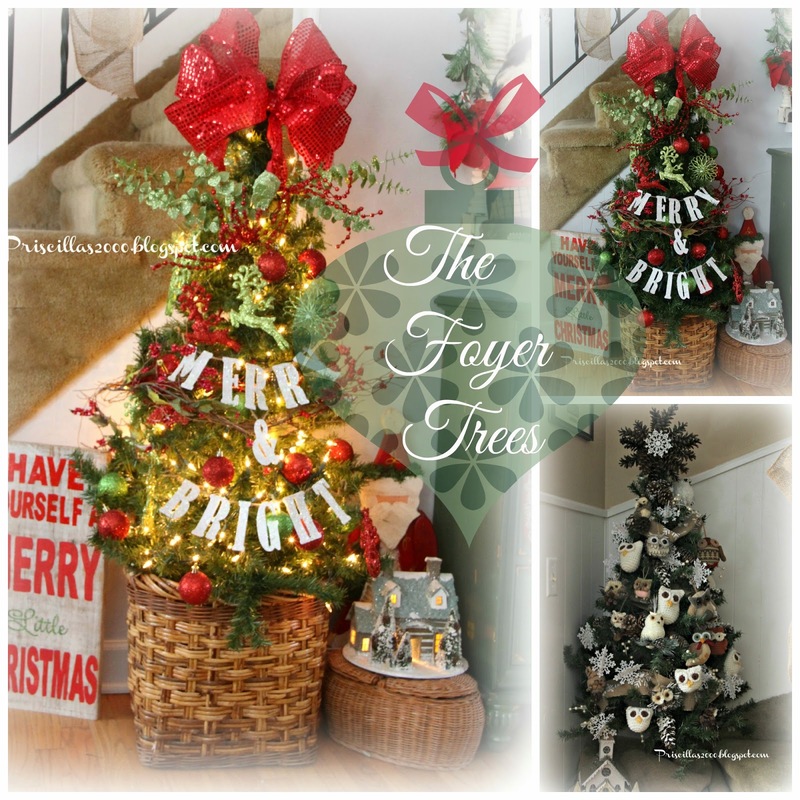 I am back from the cruise and sharing the 2 trees in the foyer! 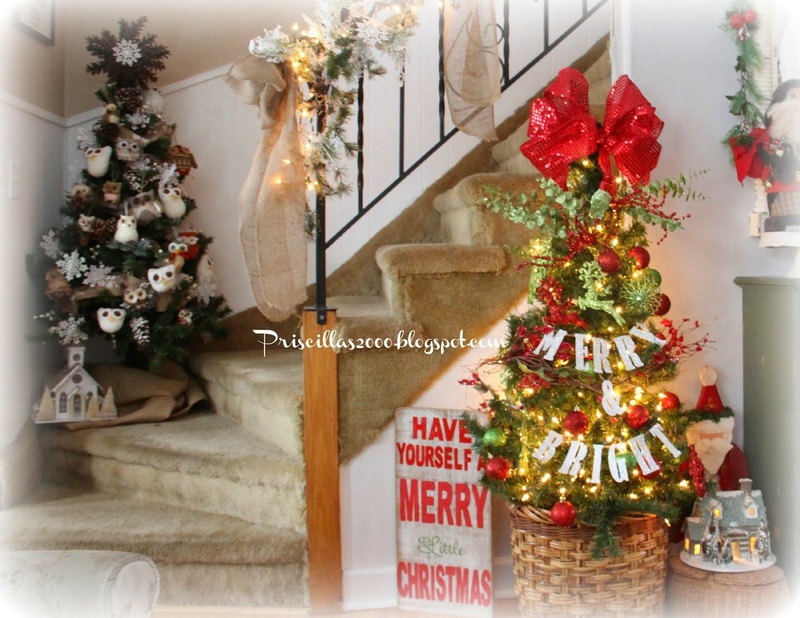 On the stairs is a tree with owl ornaments..pinecones , snowflakes and burlap.. 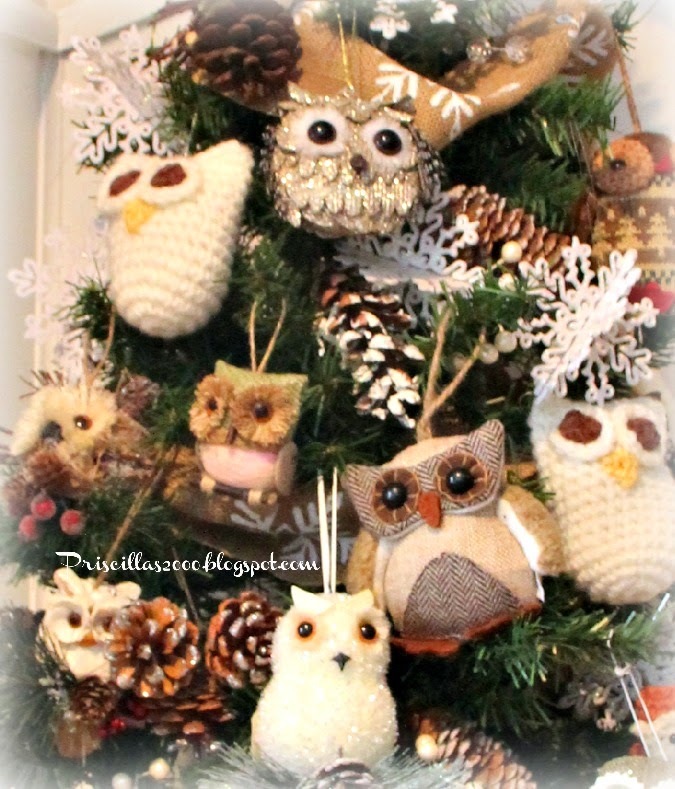 The pattern for the crocheted owl ornaments is here.. 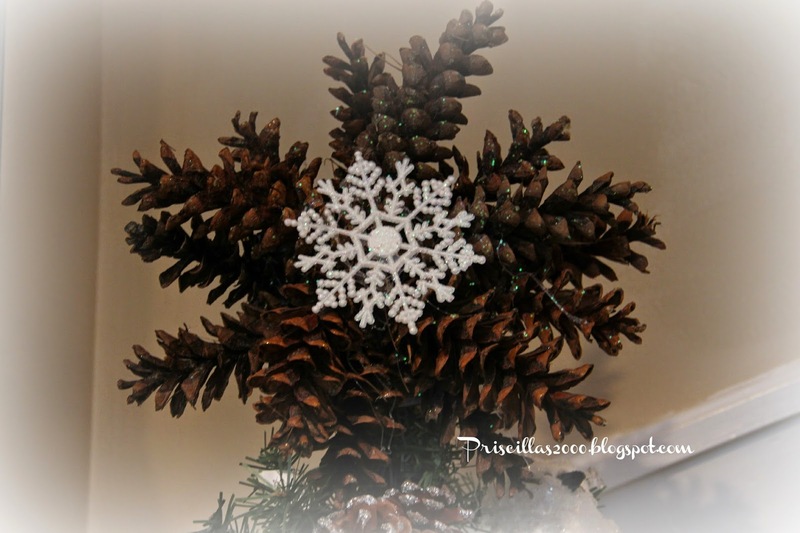 I made the tree topper from pinecones , a dollar tree snowflake ornament and a paper towel roll.I just glued the pinecones to a small piece of cardboard..then added another layer of pinecones on top , and the snowflake on top of the second layer. I used hot glue for the glueing. I glued about a 6 inch piece of the paper towel roll to the back and used that to stick the top branch of the tree in. I then sprayed it with some glitter spray so it sparkles. There is no plug where this tree is so there are no lights on it. There are so many owl ornaments available now ! I have never had a tree right in this spot where the merry and bright tree is . I got the basket at a church rummage sale for 50 cents this summer .. 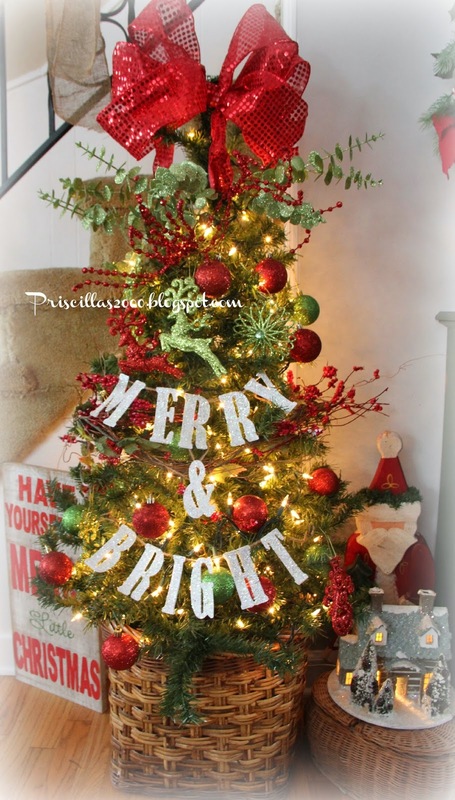 I made the merry and bright banner with my cricut ..cut each letter out twice and glued them together. Then used mod podge and dipped them in glitter. I glued them to a piece of twine for hanging. The lime green and red ornaments I bought at Walmart last year for 10 cents each after Christmas. I also added some Dollar Tree Ball ornaments. There is a berry garland and red and green berry and floral picks at the top. I made a bow for the top from red sequin wired ribbon. You're too much! I'm just amazed at all of the decorating you do. I'd love to know what kind of vitamins you take! :) I know, you're young and I'm olden! I'll just enjoy all of your amazing Christmas decorating! Both trees are so pretty!! I agree with Shelia.. I don't know how you have the energy to do all of the decorating that you do AND take a cruise right in the middle of it all. 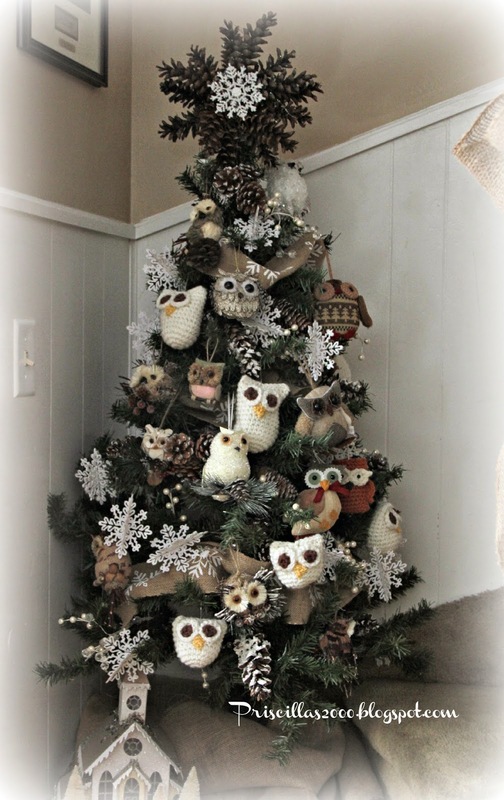 Your owl tree is so cute.. Did you make all of the owls ? 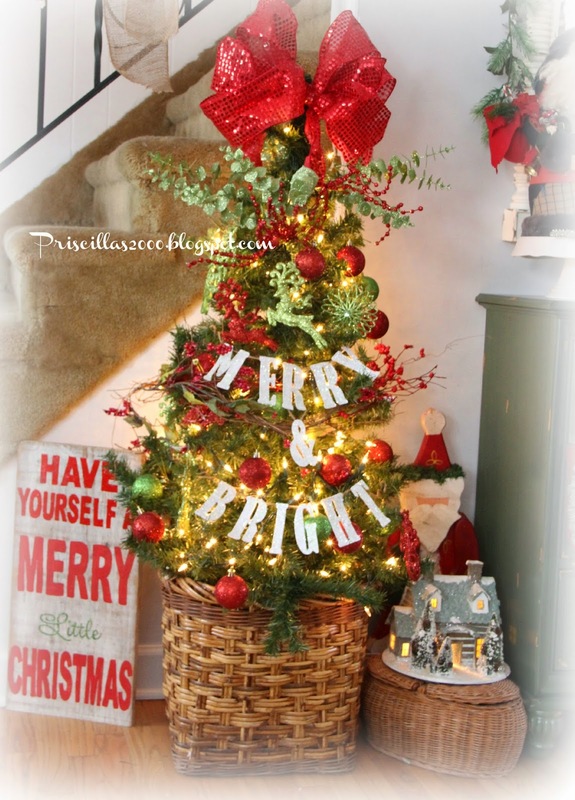 The Merry and Bright tree looks nice in it's special place.. I think I've finished with my decorating. Need to do my cars and wrap gifts.. Time if fleeting ! Love them both, so much to look at. Those are both such cute trees, but the one with owls is just so adorable! 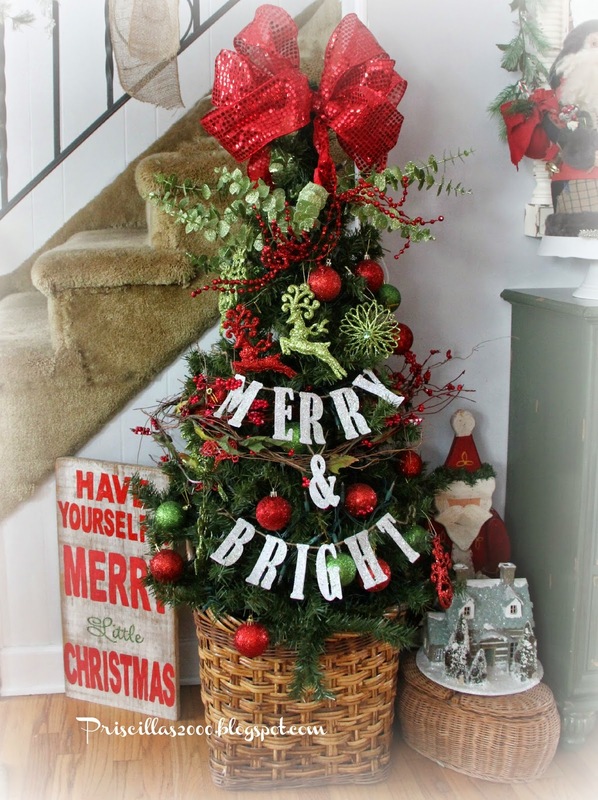 I really like the idea of the pinecones as the tree topper -- so clever! WOW! LOVE your owl tree! I want to coem and live at your house! 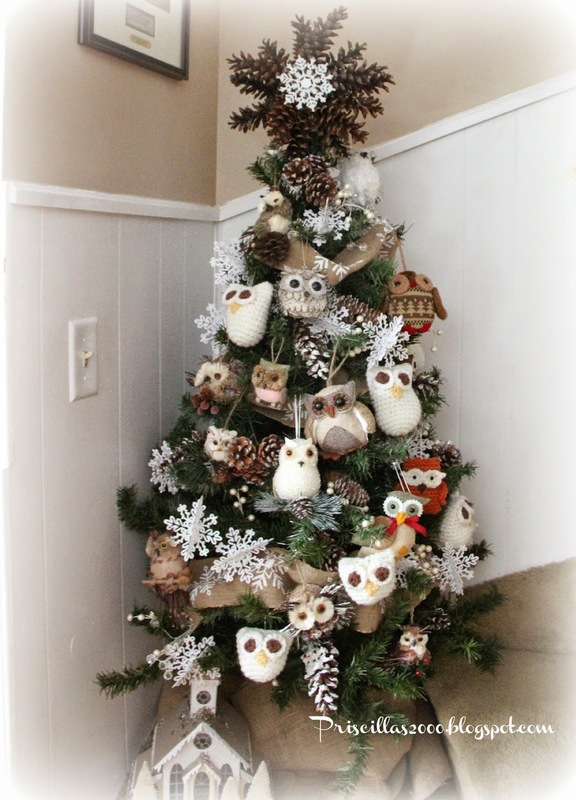 Love that owl tree! Have a Merry Christmas! Thank you for joining HSH!